Springwater runs on a four-day week, with two Fridays a month reserved for on-site and off-site field study. These field studies are designed by Springwater teachers to ensure alignment with the curriculum, and are assisted by a core group of trained parent volunteers. Teachers at Springwater are the heart of our school! They are highly trained professionals who love their students and the opportunities for customized teaching that this environment provides. Parents provide much classroom support as well, fostering close communication between teachers and parents. Faculty profiles are available for all staff members. Springwater is situated on a rural 5-acre setting in what used to be the Logan Elementary School on Springwater Road in Oregon City. Located near the Clackamas River and surrounded by agricultural and Metro lands, the setting is ideal for the realization of Springwater’s focus on environmental sciences. Bus service is provided from the downtown Oregon City area to facilitate transportation. The majority of school decisions are made by the Board of Directors, consisting of parent volunteers who serve a specified term. 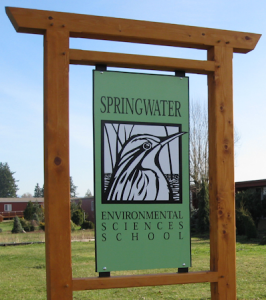 The Springwater school charter was recently extended by a vote through Oregon City School District Board, who expressed their strong support for the Springwater leadership and educational process. The building principal administers the daily operation of the school and provides leadership for the staff. All other leadership roles are filled by parent volunteers. We would be glad to talk on the phone about Springwater School. See the Enrollment Page for information. We look forward to meeting you!